Have you been living in Spain for a while without a residence permit? Do you suffer some fear due to that? You should stop worrying about it because we have the solution. With the process of arraigo in Spain, you will be able to get your temporary residence permit to work and live with it for a year. Would you like to learn more about the topic? Then make sure you get paper and a pen and start taking notes! WHAT IS THE PROCESS OF ARRAIGO? As we have mentioned, the arraigo is a process that consists of the authorization for those foreigners in an irregular situation to live and work in Spain during a year (with the possibility of subsequent renewal in the form of an actual residence permit) for exceptional circumstances. Through the procedure of arraigo, you will be able to reside legally in Spain, so as to work both as an autonomous worker (por cuenta propia) or being hired (por cuenta ajena) anywhere in the country. But, what are we referring to when we mention exceptional circumstances? 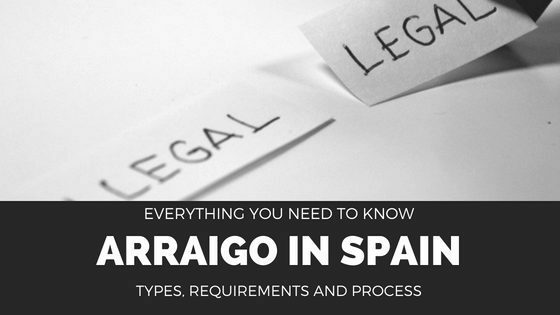 Which are the requirements that the applicant should fulfil in order to solicit the arraigo in Spain? There are three different types of arraigo: arraigo familiar, arraigo social and arraigo laboral. Each of them has certain specific requirements associated with, which we must fulfil if what we want is to carry out the application procedure. Nevertheless, there are some generalizations we can extract. First of all, the concept of arraigo is designed just for those individuals that are not originative citizens of a country member of the European Union. If you are living in Spain and come from a Latinoamerican country, for example, you can apply for the arraigo. Besides, and as we will see next, the arraigo demands the contribution of any type of document that credits the link between the applicant and Spain (and its society). This can take place at a more cultural degree as well as a personal relations one. A copy of the passport of the origin country and the lack of criminal records (both in Spain and in the origin country) are documents that will also be completely necessary for each of the three types of arraigo. The official application form to get the residency in Spain for exceptional circumstances is the EX-10 model. Nowadays, 3 are the existing types of arraigo: social, familiar and laboral; each of which is characterized by different natures. They have different conditions and associated requirements that we should take into consideration. When it comes to immigration concerns, it is highly probable that the arraigo is your best alternative in order to live and work legally in Spain. But before getting the residence via arraigo, you should clearly know what each of the three types consists of in order to choose the one that best fits your case. The residency via arraigo familiar will be granted to those foreign citizens which parents are originative from Spain, or to those whose children aged under 18 do have the Spanish nationality. The main upside of the arraigo familiar is that, opposed to the other two types, it does not have tied to itself any kind of temporary requirement. That is, although the arraigo social or arraigo laboral require having been residing in Spain for a certain period of time and the need to prove it, the arraigo familiar does not. The birth certificate of the Spanish child if we are the father or mother of him or her. The birth certificate of the Spanish originating father or mother together with the one of the applicant, for the alternate case. With the arraigo laboral, we do find a temporary requirement. It will be granted only to those individuals who can accredit labour relations in Spain for at least 6 months, in addition to having lived in Spain continuously for 2 years. During the months that the applicant has not been employed, he or she must have been enrolled in the INEM (National Employment Institute). In what way can we prove that we have been living in Spain for 2 years continuously? In this case, documents such as the census will be an effective proof, this being the probative document par excellence. However, there is freedom as to how we can demonstrate the duration of the residence. And what if we cannot present the census? Well, in that case, we can make up for his absence with other alternative documents. The existence of a bank account with some transactions, a rental contract or medical certificates (if we had to go to the emergency department for example) are equally valid documents for that purpose. The ideal at this point (in the absence of the census) would be to provide an alternative probative document for each of the corresponding months of residency. Finally, the last type of arraigo: arraigo social. This is, without any doubt, the most demanded procedure within the 3 existing ones. With the arraigo social we find again a temporary requirement: we must have stayed continuously in Spain for 3 years. What do we mean by the term “continuously”? For the duration of the residence to be considered as continuous, the applicant must not have been outside of the country for more than 120 days. In this way, it is necessary to prove that you have lived in Spain for at least the last three years. Therefore, you must provide the “Historic Census” of each location where you have resided during all this time. In addition, a work contract of at least 1 year must be submitted in order to be able to obtain temporary residence via arraigo social. Another of the valid but not essential documents to achieve this type of arraigo is that which demonstrates the existence of family ties with foreigners residing legally in Spain. We refer to children, parents or partners. The arraigo social has certain peculiarities. In the case of not having those family members, we will need a certificate of social integration to demonstrate the link with the Spanish society. In what way can we prove it? Through a favourable report. The demonstration of social insertion in Spain and its community is achieved through this report. And it is, without any doubt, one of the most important requirements in order to achieve the arraigo in Spain. After an interview with the town council of the pertinent locality, in which it is necessary that the person requesting the arraigo demonstrates its connection and integration to the Spanish State (knowledge of the language, culture, etc. ), that institution issues its assessment and proceeds to validate the report. The understanding and speaking of the Spanish language are one of the main points to analyze in the meeting. In the case of the Autonomous Communities with their own language, as its the case of Catalonia, it is also important to understand and/or speak Catalan. Another requirement will be the accreditation of the existence of a company or freelancer willing to hire us. In relation to this employer or company, it will be essential that its economic activity has been operating for at least one year. We must present the documentation that proves its identity (ID or CIF) and its solvency, among others. Depending on the Autonomous Community in which the applicant is located, it is very likely that certain requirements will arise in order to obtain the arraigo social. For example, in the case of residing in Catalonia, it will be necessary to take a 45-hour Catalan course in order to demonstrate the understanding of that language. That is why we must consult in detail what are the exact requirements according to our place of residence, to make sure we do not forget anything. There is something we must bear in mind regarding the documentation to be presented. All documents that are submitted for the arraigo procedure and that come from the applicant’s country of origin (among others, criminal records) must be legalized/apostilled and translated into Spanish. If you have any problem with the apostille or the legal translation, our lawyers will take care of all these necessary procedures for you. Once we have achieved the temporary residence through the arraigo, whether social, familiar or laboral; we can reside and work freely and legally in the Spanish territory. But just for a period equivalent to one year. And then? Can we renew or extend this permit? The answer is no. However, although we can not renew it, we can modify the residence permit for exceptional circumstances and convert it into a permanent one. To continue residing and working legally in the Spanish territory, we can then apply for a work visa, and thus continue working either on our own as an autonomous (permiso de residencia por cuenta propia), or on behalf of another person (permiso de residencia por cuenta ajena). DO YOU WANT TO START THE ARRAIGO APPLICATION PROCESS? Then do not hesitate to contact our lawyer team, we will be in charge of everything! balcellsg, thank you for this post. Its very inspiring. balcellsg, thank you ever so for you post.Much thanks again. how long/how many months is the process of arraigo social. The response from the Immigration Office can take up to 3 months. Pls is it true you have to attend 90hrs of Catalan class and 90hrs of Spanish class to be able to apply for arraigo? The course is actually 45h long, not 90! I have a prove that I have been here since December 2016 I lost my pasport on the 5 of jenuary 2017 wish is the day of festival and I reported to the police with my sister and inlaws who has lived here for 20 years ..but my apadronamiento is just a year and 5 months because of the delay of getting another pasport …but I have the report paper from the police wish prove I have been here for 3 years this coming December….can I apply for arriago social with this? As your situation is really concrete and specific, we would really recommend if you could send us an email at info@balcellsgroup.com so a specialized lawyer can carefully look at your case and determine what should you do in this situation. Thank you very much for reaching out to us, we will be glad to help you out with the arraigo! If you send us an email at info@balcellsgroup.com we will explain to you our range of prices. Thank you very much for reaching out to ous, we hope we can help you get your arraigo! If go over the arraigo laboral process you just need 2 years of living in Spain, but then you also need to accredit a working relationship for at least 6 months. Is that the case? Hi! I just wanna ask information how much it cost for processing arraigo in Madrid? If you would like to know about specific prices, we would really suggest you send us an email at info@balcellsgroup.com and we will inform you, as it will depend on your situation.